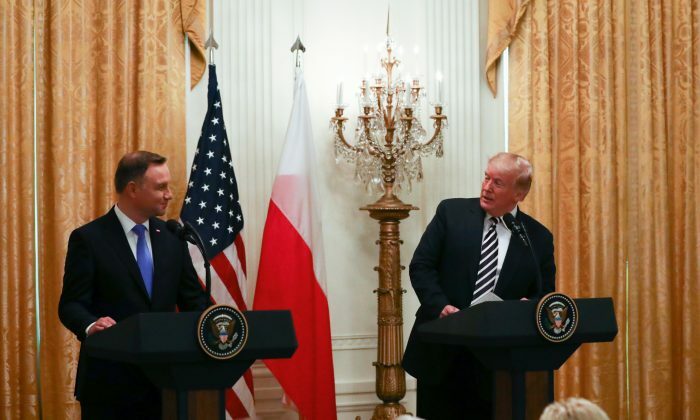 WASHINGTON—President Donald Trump told Polish President Andrzej Duda that he’s considering his counterpart’s offer of putting a U.S. military base in Poland, because of concerns about Russian military aggression in the region. Duda offered to pay more than $2 billion for the permanent base, according to Trump, who cited it as a potential model for other “wealthy” nations that have asked for a U.S. military presence. He told reporters before their meeting at the White House that security in Poland was “extremely” important to him. In 1997, the United States and its NATO allies entered a pact with Russia that prevented NATO from permanently stationing “substantial” combat forces in Central and Eastern European countries, including permanent bases. But the treaty left open the possibility for “reinforcement” in the event of defense against a threat of aggression, which Duda says is now the case. “I am convinced that there is no more effective method of preventing a war than a decisive stance demonstrating that we are ready at any moment to repel a possible attack,” Duda said. Duda offered to call the base or bases “Fort Trump,” likely playing to the president’s tendency to incorporate his family name into buildings he’s built, such as Trump Tower in New York and Trump International in Washington. The two leaders also agreed to collaborate on energy, although no specific deal was announced. Poland is trying to wean itself from Russian natural gas, while at the same time building up a supply chain from the United States and Norway to replace it. Duda cited Russia’s history of shutting off gas supplies to countries during times of conflict as to why that’s become a national security issue for Poland, which gets about two-thirds of its natural gas from the Kremlin-controlled Gazprom PJSC. Last June, the United States sent its first shipment of liquified natural gas to Poland after its state-owned natural gas and oil company signed a five-year contract with a UK-based energy company with a branch in the United States. “I firmly believe that … we are not only going to realize and safeguard our own energy needs, but I also hope that we’ll be able to transmit gas further to our neighbors through the development of the Three Seas Initiative area through the construction of interconnectors,” Duda said of U.S. natural gas. The Three Seas Initiative is a forum for EU countries in Central and Eastern Europe to discuss issues related to the 12 member states. Without giving a timetable, Trump said the U.S. and Poland planned to launch a “high-level diplomatic exchange” on energy security. “The United States and Poland are deeply committed to energy diversity all across Europe. No nation should be dependent upon a single foreign supplier of energy,” he said.